The work is signed in the plate "Bonnard" in the lower right part, beneath Renoir’s elbow. My understanding is that this work was published in a limited edition of circa 150 impressions in 1916, although the print is unnumbered. Hand signed "Pam Li, 1982" in the bottom right corner and entitled "Cadbury". Very limited edition with this being hand numbered 1 of 4. PAM LI is the art director for. Johns Hopkins Magazine. Prior to coming to Johns Hopkins, she was an art director with Waldinger Birch Inc., a marketing and communications firm. Etching is from a later pressing. Les Chansons Eternelles 1897. Paul Berthon. This is the original lithograph, printed in 1897, not a later reprint or copy. drawing for the cover of a book by Paul Redonnel. Il s'agit d'un original et pas d'une copie ou d'une re-impression. 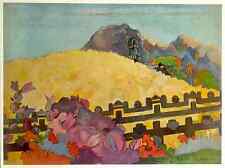 HIS WORK WAS INFLUENTIAL TO THE FRENCH AVANT - GARDE AND MANY OTHER ARTISTS SUCH AS PICASSO AND MATISSE. THIS AUTHENTIC LITHOGRAPH PRINT WAS PRINTED IN 1972 IN JAPAN. THIS LITHOGRAPH PRINT IS SUITABLE FOR FRAMING. Item is Not Reprint ,Giclee Print Nor Ink Jet Print, Item is Original Shorewood 1960s 1st Edition Printing Lithograph. Paper and inks were carefully chosen for the most felicitous effect. They cannot be compared to most recent fine art prints and giclées, even of identical images, in which the colors, tonality and details are often dull and imprecise by comparison. Dimitrios Emmanuel GALANIS. A very good impression of this scarce lithograph. Original stone Lithograph on Japan paper. Size of the lithograph : 9 in x 11 1/2in - 29 cm x 23 cm. with the ' La Galerie des Peintres-Graveurs' blind stamp. Suzanne Humbert. Original C.1930 Lithograph. This is the original lithograph, printed in C.1930, not a later reprint or copy. Les métiers. - 28,5 x 38,5 cm. Il s'agit d'un original et pas d'une copie ou d'une re-impression. Ker Xavier ROUSSEL. "Pastorale". Original stone Lithograph on Japan paper. A very good impression of this scarce lithograph. This is an original print not a modern reprint! Size of the sheet : 14 1/2 in x 11 in - 37 cm x 28 cm. Wassily KANDINSKY. Original Greeting card of the new year for the Gallery Maeght. Size of the card : 9 in x 14 1/2in - 37 cm x 21 cm. Il s'agit d'un original et pas d'une copie ou d'une re-impression. 2nd edition, printed in just 30 copies, large 31" x 23"
Gaston de Latenay. Bords de l'Escaut, C.1900. This is the original etching, printed in C.1900, not a later reprint or copy. Hand-signed on vergé "de lattre" paper. - 22 x 29 cm. Il s'agit d'un original et pas d'une copie ou d'une re-impression. Schaefer Miles are the husband/wife team. 48 US States only. See pic of CoA, this is #2 of 50. Hypnotic entertainer and shrewd entrepreneur Aristide Bruant was one of Toulouse-Lautrec’s first friends in Montmarte. They were forewarned— a sign at the door read: “For people who like to be told off.”. (Toulouse - Lautrec's monogram is printed in the lower left corner. 10 1/2 x 6 7/8in. and is in good lightly age toned condition. 15 1/4 x 12in.). Maximilien Luce (1858-1941). Original Woodcut Japan paper. "PORTRAIT". Size of the print : 7 in x 5in - 18 x 12 cm. JAPAN & AUSTRALI A. Il s'agit d'un original et pas d'une copie ou d'une re-impression. This is the original lithograph, printed in 1950, not a later reprint or copy. Original W/B & color lithograph. Pierre BONNARD. Withe the 'La Galerie des Peintres-Graveurs' blind stampe. Original stone Lithograph on Japan paper. Size of the lithograph : 11 3/4 in x 8 1/3in - 21 x 30 cm. A very good impression of this scarce lithograph. Suzanne HUMBERT. Original stone Lithograph on Vélin paper. A very good impression of this scarce lithograph. Hand signed by the artist and numbered "Epreuve d'artiste 11/15. Il s'agit d'un original et pas d'une copie ou d'une re-impression. Le marchand de marrons. C. 1894 (1925). A very good impression of this scarce lithograph. Original stone Lithograph on china paper. This is the second printing done by Frapier in 1925 from the original plate. 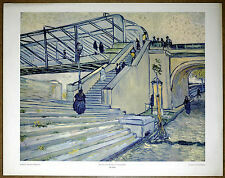 Item is Not Reprint ,Giclee Print Nor Ink Jet Print, Item is Original Museum of Modern Art Lithograph Print. Cézanne can be said to form the bridge between late 19th-centuryImpressionism and the early 20th century's new line of artistic enquiry,Cubism. Kept Flat, in a Smoke, Dust, and UV Light Free storage facility for over 30 years that has allowed the Image to retain its brilliancy without any fading. rolled Onto the inner tube NOT inside the inner tube. "Le moulin de la Naze". Maurice DE VLAMINCK. Original stone Lithograph on Japan paper. A very good impression of this scarce lithograph. with the ' La Galerie des Peintres-Graveurs' blind stamp. This is an original print not a modern reprint! Émile Antoine BOURDELLE. "La Mort du cygne". Original stone Lithograph on Japan paper. A very good impression of this scarce lithograph. This is an original print not a modern reprint! Size of the sheet : 14 1/2 in x 11in - 37 cm x 28 cm. Jeanne BARDEY. "Portrait de Rodin". Original stone Lithograph on Japan paper. A very good impression of this scarce lithograph. This is an original print not a modern reprint! Size of the sheet : 14 1/2 in x 11in - 37 cm x 28 cm. Paul Cezanne Gulf of Marseille. Cézanne can be said to form the bridge between late 19th-centuryImpressionism and the early 20th century's new line of artistic enquiry,Cubism. BothMatisse andPicasso are said to have remarked that Cézanne "is the father of us all. Maximilien Luce (1858-1941). Original Woodcut Japan paper. This is an original print not a modern reprint! Size of the print : 6 in x 5in - 15 x 12 cm. JAPAN & AUSTRALI A. Il s'agit d'un original et pas d'une copie ou d'une re-impression. Item is Not Reprint,Giclee Print Nor Ink Jet Print, Item is Original 1960s 1st Printing Shorewood Lithograph Art print. Paper and inks were carefully chosen for the most felicitous effect. They cannot be compared to most recent fine art prints and giclées, even of identical images, in which the colors, tonality and details are often dull and imprecise by comparison. Original drypoint vergé paper. Maximilien Luce (1858-1941). A very good impression of this scarce etching. Size of the sheet : 10 in x 18in - 25,5 cm x 33 cm. Size of the print : 10 1/2 in x 7 1/2in - 19 x 25 cm. Luc Albert MOREAU. Original stone Lithograph on Japan paper. A very good impression of this scarce lithograph. Le cocktail. This is an original print not a modern reprint! Size of the sheet : 14 1/2 in x 11 in - 37 cm x 28 cm. Maximilien Luce (1858-1941). Original Woodcut vergé paper. This is an original print not a modern reprint! Size of the print : 7 in x 4 4/5in - 12 x 18 cm. Il s'agit d'un original et pas d'une copie ou d'une re-impression. Maximilien Luce (1858-1941). Original Woodcut vergé paper. This is an original print not a modern reprint! Size of the print : 6 3/4 in x 4 1/3in - 17 x 11 cm. Il s'agit d'un original et pas d'une copie ou d'une re-impression. Charles Louis Maurice Eliot, 1862 - 1945. 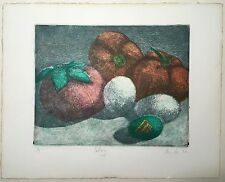 L’Estampe Moderne (Modern Print) Antique original 1897 multi-color stone lithograph – Not a copy or a modern reprint. was a French monthly publication published between May 1897 and April 1899, which proposed 4original lithographs in each of its issues. "place du Tetre". Maximilien Luce (1858-1941). Original Woodcut Japan paper. Size of the print : 7 in x 5in - 18 x 12 cm. JAPAN & AUSTRALI A. Il s'agit d'un original et pas d'une copie ou d'une re-impression. Artist: Toulouse Lautrec. Date: 1949. Publisher: F.A.R. Gallery. Condition: very good image. P rinted: New York. even discoloration. Alexandre ORSI (1889-1947). "Le condor". Original stone Lithograph on vélin paper. Size of the lithograph : 17 in x 12 1/2in - 32 cm x 43 cm. A very good impression of this scarce lithograph. Il s'agit d'un original et pas d'une copie ou d'une re-impression. Maximilien Luce (1858-1941). Original Woodcut Japan paper. This is an original print not a modern reprint! Size of the print : 7 in x 5in - 18 x 12 cm. JAPAN & AUSTRALI A. Il s'agit d'un original et pas d'une copie ou d'une re-impression. Schaefer Miles. Schaefer Miles (Husband & Wife Team: Wendy Schaefer-Miles & Kevin Miles). BEAUTIFUL SERIGRAPH! THIS IS A SERIGRAPH SIGNED ON THE LOWER LEFT. THERE IS A COA ON BACK. Wendy and Kevin live to paint and paint to live. Item is Not Reprint,Giclee Print Nor Ink Jet Print, Item is Original 1960s 1st Printing Shorewood Lithograph. Paper and inks were carefully chosen for the most felicitous effect. They cannot be compared to most recent fine art prints and giclées, even of identical images, in which the colors, tonality and details are often dull and imprecise by comparison. Artist: Henri Toulouse Lautrec (French 1864 - 1901) Title: N/A Date: 1990 Signed & Numbered: No Print Size: 19.75w" x 27.75h" Print Type: Off-set Lithograph Publisher: Wizard & Genius-Idealdecor Printer: Printed in Switzerland Condition: Very Good; Print color is has minor discoloring & yellowing, but paper is clean, no major marks or water damage. PLEASE SEE PICS!. Maurice ASSELIN. Original stone Lithograph on Japan paper. A very good impression of this scarce lithograph. with the ' La Galerie des Peintres-Graveurs' blind stamp. This is an original print not a modern reprint!